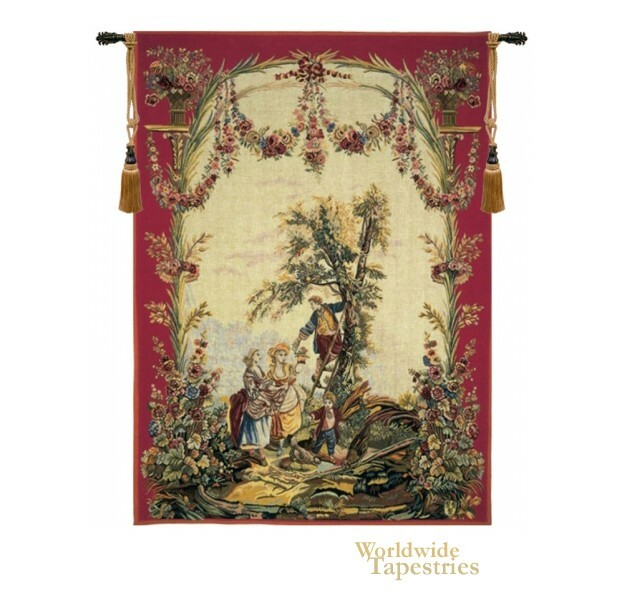 Le Temps Des Cerises (Cherry Time) tapestry shows a scene based on an 18th century Beauvais tapestries by Jean Baptiste Huet. The original tapestries portray a series of countryside scenes. Here we see a cherry harvest scene, in Rococco style by Huet (1745-1811), whose artistic style was influenced by the art of Francois Boucher. Here in this cherry pickers tapestry we see a man, women and child harvesting cherries, in the countryside beside foliage, and a pheasant. Floral garlands decorate the work above. This French tapestry "Le Temps Des Cerises (Cherry Time)" is backed with a lining and has a tunnel for easy hanging. Note: tapestry rod, tassels, and accessories, where pictured, are not included in the price.